Taxiphyllum barbieri is commonly called Java moss, but true Java moss, Vesicularia dubyana, was phased out in the 1970s in favor of Taxiphyllum Barbieri. This species is very undemanding and has a wide variety of applications in tropical aquariums and vivariums. Taxiphyllum tolerates all kinds of light levels and all kinds of water, even mildly brackish. This moss can live in temperatures as high as 85 or 90°F (29 or 32°C), though it grows best at 70 to 75°F (21 to 24°C). 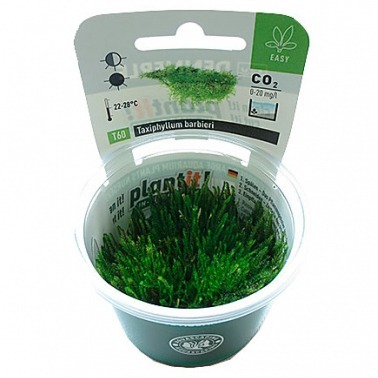 This is a great plant for placing in the foreground on stone or wood, and it can also be formed into a moss wall. This can be accomplished by folding a net and spreading the moss over it. Then the net can be secured together by polyester strings, and attached with suction cups to the tank wall. Taxiphyllum barbieri should be located where there is good water flow. 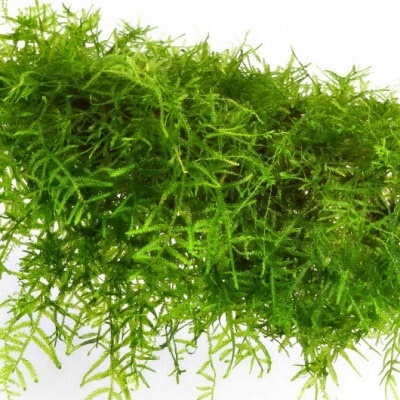 Moss is especially good for providing a hiding place and food source for fry fish (baby fish).